Today, we will review Negative in Simple Present Tense. If you need more help on this, please go back to Lesson 62. Please follow the examples and finish the job. Best. I don’t go to Brazil. من به برزیل نمی روم. 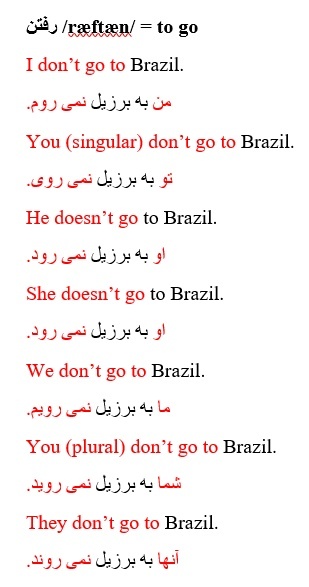 You (singular) don’t go to Brazil. He doesn’t go to Brazil. She doesn’t go to Brazil. We don’t go to Brazil. You (plural) don’t go to Brazil. They don’t go to Brazil. You (singular) don’t eat lunch. 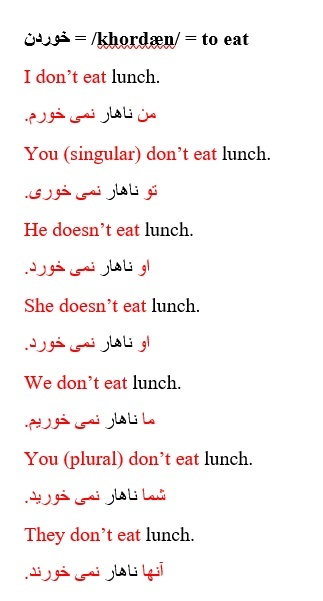 You (plural) don’t eat lunch. I don’t listen to the radio. من به رادیو گوش نمی کنم. 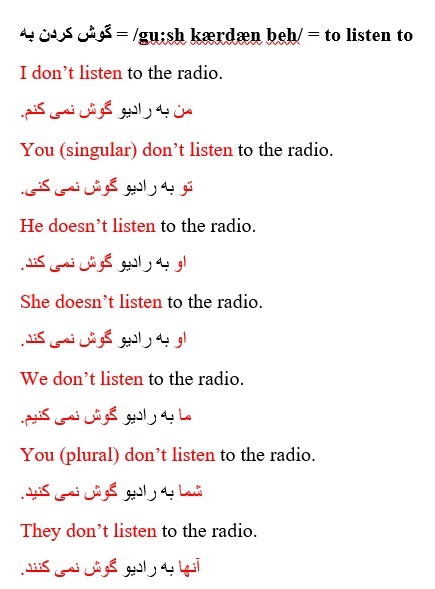 You (singular) don’t listen to the radio. He doesn’t listen to the radio. She doesn’t listen to the radio. We don’t listen to the radio. You (plural) don’t listen to the radio. They don’t listen to the radio. I don’t see your friend. من دوستت را نمی بینم. You (singular) don’t see your friend. 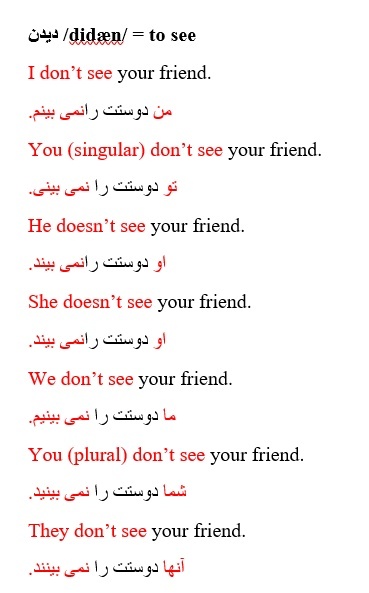 He doesn’t see your friend. She doesn’t see your friend. We don’t see your friend. You (plural) don’t see your friend. They don’t see your friend. I don’t read a book. 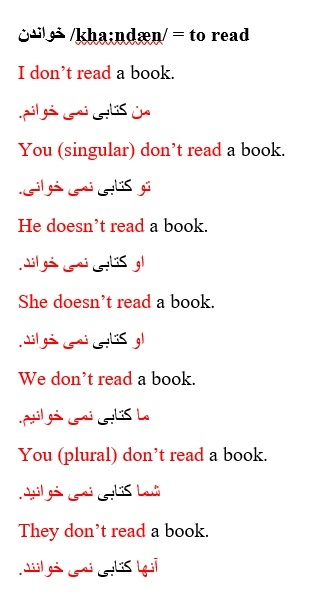 You (singular) don’t read a book. He doesn’t read a book. She doesn’t read a book. We don’t read a book. You (plural) don’t read a book. They don’t read a book. I don’t write a letter. من نامه ای نمی نویسم. 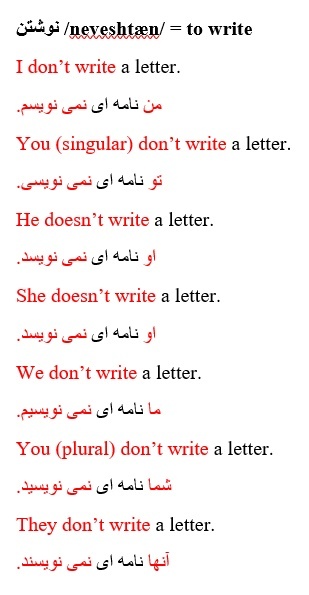 You (singular) don’t write a letter. He doesn’t write a letter. She doesn’t write a letter. We don’t write a letter. You (plural) don’t write a letter. They don’t write a letter. I don’t clean my car. من ماشینم را تمیز نمی کنم. 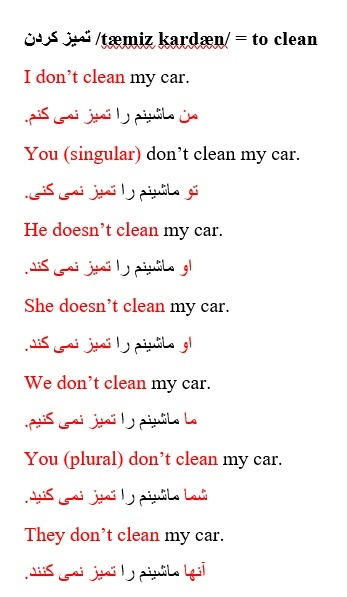 You (singular) don’t clean my car. He doesn’t clean my car. She doesn’t clean my car. We don’t clean my car. You (plural) don’t clean my car. They don’t clean my car. I don’t sell my house. من خانه ام را نمی فروشم. 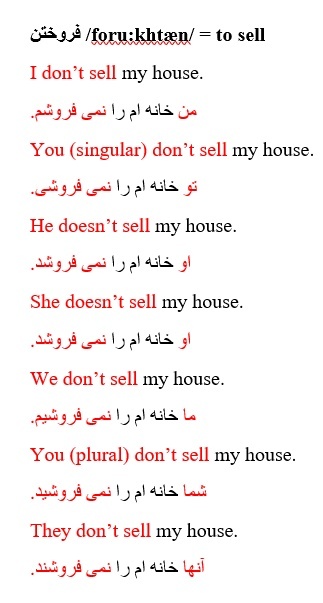 You (singular) don’t sell my house. He doesn’t sell my house. She doesn’t sell my house. We don’t sell my house. You (plural) don’t sell my house. They don’t sell my house. I don’t wash the dishes. 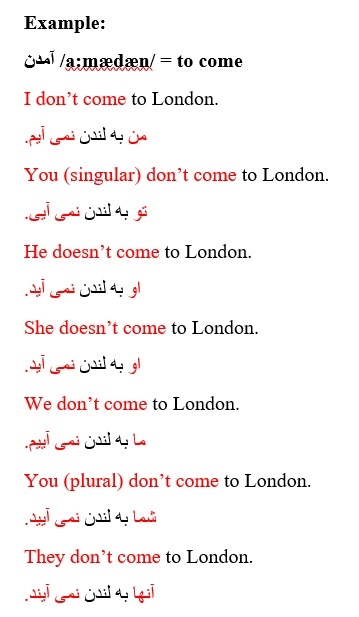 من ظرف ها را نمی شویم. You (singular) don’t wash the dishes. He doesn’t wash the dishes. She doesn’t wash the dishes. We don’t wash the dishes. 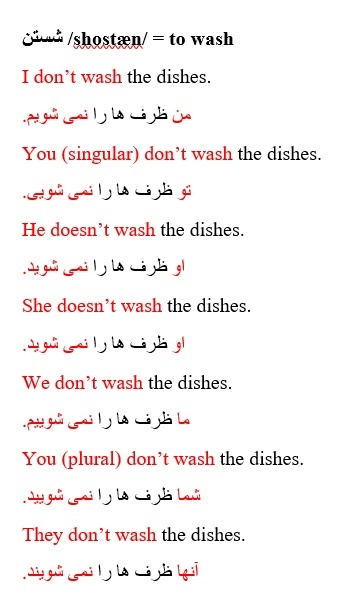 You (plural) don’t wash the dishes. They don’t wash the dishes. I don’t buy a car. You (singular) don’t buy a car. He doesn’t buy a car. She doesn’t buy a car. We don’t buy a car. You (plural) don’t buy a car. They don’t buy a car. Hope you enjoyed it. Keep practising. See you next week.